ozee1088 What's the latest price target? inphyy Vested at 3.1. Today high price 3.21. Still have room to inch up. Cheers! cascoc How high can it go this time? inphyy Our system’s recommendation today is to STAY LONG. The previous BUY recommendation was issued on 8/10/2013, 10 days ago, when the stock price was 3.0800. Since then C31.SI has risen by +3.25%. Candlesticks warned us today to be on alert with a new bearish pattern. Market attention is now on the downside. CapitaLand Limited wishes to announce that its financial results for the third quarter ended 30 September 2013 will be released before the start of trading on Thursday, 31 October 2013.
cascoc 3.12 ...will it go below ? soul9110 what happen to this counter? keep droping from last few week till now? inphyy Again? low 3.01...closing bell 3.04.
clarence_yeo2003 capitaland trading halt anyone got any news pertaining to the trading halt? commercial and residential development businesses. process underwritten by Citigroup Inc., according to the filing. trading was halted in Sydney and are up 10 percent this year. clarence_yeo2003 CNBC report today daiwa has a sell call on capitaland with target price 2.65.
inphyy Arrhh! don't think so. After disappointed results, me placed at 2.98. Last 2 weeks low at 3.01. At weighted average of S$3.0037 per share. CapitaLand Limited (CapitaLand) announced that it has bought back an aggregate of 2 million shares of CapitaLand in an on-market share buyback exercise on the Singapore Exchange Securities Trading Limited on 6 December 2013. This was in pursuant to the Share Buyback Mandate approved by shareholders at the Extraordinary General Meeting of CapitaLand held on 26 April 2013. 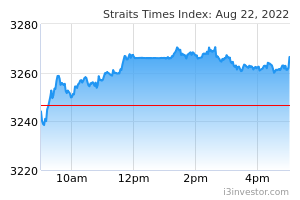 The Shares were bought back at the weighted average price of S$3.0037 per Share. CapitaLand will hold the bought back Shares as treasury shares. At approximately 17% discount to CapitaLand’s Net Tangible Asset of S$3.63 as at 30 September 2013, Management believes that the current CapitaLand share price is attractive given the outlook for CapitaLand’s businesses in Singapore and China. CapitaLand may consider further Buybacks subject to market conditions. nphp1117 What's price of this stock expected in 12-18 months time? flekswood @nphp1117 with China slowing down, I expect further downside in the medium term towards S$2.50 range. nphp1117 @flekswood thanks for feedback. In that case I have to hold it longer term. Feler Sed Post removed. Why? maomao Is it worth to invest on this counter now? Ruth Lim Would suggest to hold on for a while, look for Level 2.99-3.01 to enter, which will be it nearest support level. Over all looking positive on charts. wangly0002 Issued convertible bonds: good or bad?